My book has been nominated for an award! I have been nominated for a few awards over the years but this one means A LOT as it is nomination by people from within the infertility community, I am SO excited and SO honoured. "The Best Book award is given to an author who has written and published a book that covers one or more of the following topics: coping with infertility, choosing a family building option, mind/body techniques as it relates to infertility or personal relationships and infertility." I don't think I stand a hope in hell of winning as I am up against Alice Domar whose work just about every infertile has read (I have a copy of her book on my book shelf), but it is still a great honour to be nominated. 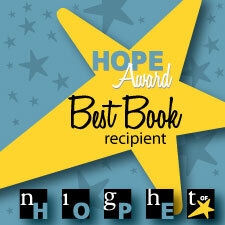 "The winner of this award will receive two (2) tickets to the Night of Hope, September 13, 2011 in New York City." If I win, I am going so going to New York to attend the function. I have never been to America (can you believe that) and I am dying to go to New York so this will be my excuse to spend 100000000s on an air ticket. EEEEK, I am so nervous/excited omgimightgotonewyork!! I know I am getting away with myself here as the chances of me winning are very remote, but I am so excited! Wow, what an honour. Voted. Break a leg. You'll also discover that Candian Bacon = ham. Wow! Congratulations and good luck! New York City is amazing!!! I voted for you, because i also want to know about the bacon thing. If you win, you will post your bacon findings on your blog, right? Right? MMmmmmmm .... bacon. Tasty, tasty, bacon. Where was I? Oh, yes, I voted. Go Tertia! Awesomness!!!! of course you will win. Yes, I also want to know about the bacon... But not in an obsessive way. Congratulations on the nomination. I experienced NYC for a total of 6 hours at what was effectively 4am for us, after not sleeping for over 24 hours. My husband moaned the whole time, but I was transfixed by the awesomeness of just being there! About the bacon. I'm an American and I do love bacon. It is awesome. (Although the ice cream thing is weird) I noticed that when I went to London, what they called bacon was not 'American bacon'. It was more of a ham/procuitto breakfast meat. Perhaps your bacon is different too. Oh, and there is definately a debate over how to cook the bacon. Fried up crispy (my fav) or limp and chewier. And some places cook better bacon than others, so if it is all greasy and gross, don't write it off completely. So, now that I have contributed to the perception of our craziness over bacon, I will go vote so you can experience it first hand. oh, and if you do have the same bacon, please explain your indifference?!? Voted for you! Congrats on all of this! I just voted for your book. I've got my fingers crossed because you have made such a difference for and inspired so many people to keep trying (including me!). Congrats and have voted. Just because Iw ant to know about the bacon thing. Nah! Just joking. Loved your book too. Having done three fertility cycles in South Africa, I can definitely say they do NOT have American bacon!